The northern edge of New York City’s Chinatown hovers about three streets away from where I’m staying. Here, it's very different from Chinatown in San Francisco, much more extensive and functional, not commercialized in any way, no catering to tourists, just a big, bustling community of hard working, hungry Chinese people. On Saturday and Sunday mornings, shoppers throng the streets, and it's often a battle to get served; Chinese grandmothers are a determined and unsympathetic lot. Few people are polite or courteous, just pushing you out of their way to get their shopping done. 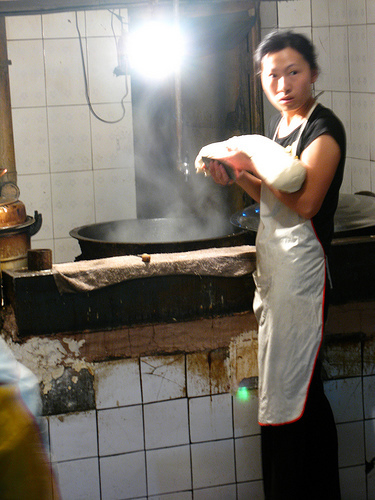 In the noodle shops, I’m usually too intimidated by the impatient women cooks to inquire about the food they're making. Once, in a steamy dumpling shop, I stared with fascination and curiosity for a long time at a enormous wok bubbling with big chunks of beef shank, quartered white onion, and thick stumps of carrot, all afloat in a dark broth the color of brown earth. I pointed and asked, "What’s that?" She cut her eyes toward me and in that sly split second assessed my utter foolishness and stupidity. Then she barked back at me, “Beef!” without looking up from her intense work assembling perhaps a dozen to-go tins. I smiled, thanked her politely, and quietly left. When I do find someone approachable, I ask, "Where is the best dumpling shop?" Everyone seems to have a preferred one, and I try to go to each them. One young butcher told me Joe’s Shanghai on Pell Street is the most famous in NYC, and I asked, "But is it the best?" I immediately regretted my question: glared at me in a deeply malicious way. It costs less than $4 for more dumplings than you can eat. One shop that goes by the imaginative name “Dumpling House” and has no sign prepares a puffy, steamed then crisped sesame pancake about 15 inches in diameter and an inch-and-a-half thick, that gets cut into individual pie-shaped sections that are then stuffed with one of several choices of filling. The roast pork is the best: crisp skin, juicy meat, green onion, cucumber, cilantro, special sauce, $2.25. A piece of pancake on the side, 75¢. Also terrific are the chive and pork fried dumplings, 8 pieces for $3.75. The shops have names like “Prosperity Dumpling House,” “Tasty Dumpling,” “Excellent Dumpling,” and “Plump Dumpling House.” I wondered, “Is it the house or the dumpling that's plump?” The breakout shop is called "Tasty Handpulled Noodles." There are very strong smelling, seductive shops that sell nothing but dried fish and shellfish. One such shop turns an entire corner. Shoppers apparently know what each piece of cuttlefish, each funny-colored shrimp, and each brittle card of whole fin fish is; of course, I don't, but I know a couple -- I have a Filipino friend who brings me various kinds of tiny dried fish his dad carries back from home -- so I screwed up my courage today and bought two pieces. The shopkeeper knew I was an idiot, and treated me like one. Now my flat stinks of dried fish. I'm sure she would say, "Yes, stupid, of course it stinks. It's your own fault." Some shops sell only dried mushrooms, some as fragrant as the fish, piled up in large baskets. One shop had 27 varieties. Once, long ago in an Oakland shop, I'd picked up a bag of good looking dried mushrooms, took them to the cashier (who owned the place) and asked, "Are these mushrooms used like other dried mushrooms?" She said, "Yes!" I then asked, "Do you soak them before throwing them in the pan?" She said, "Yes!" I continued on, "How much do they cost?" She said, "Yes!" I didn't ask this time. I wandered across the road to my favorite butcher, Cheung Kee Meat Market on Mott Street, and bought half a delicious, golden-skinned, smoked chicken for $5.50. It comes with little tub of sweet and salty sauce. Smoked chicken costs less than half the price of smoked duck, but it’s just as good.